The University of New Brunswick launched its $110 million It Begins Here campaign today at simultaneous events in Fredericton and Saint John. 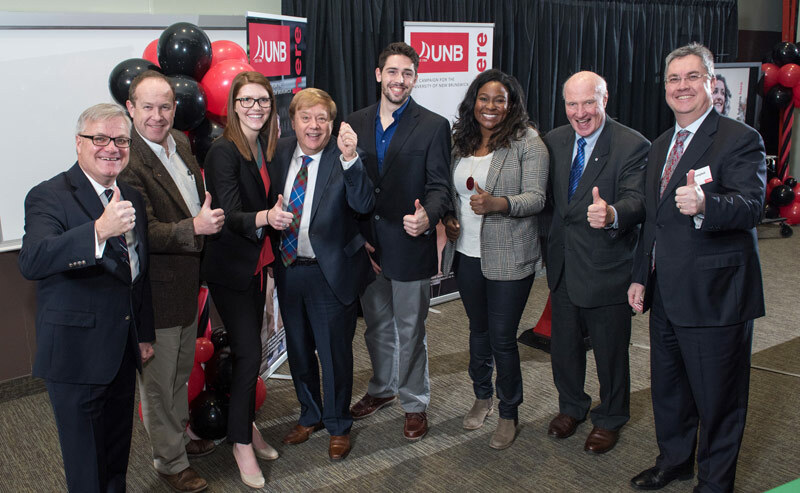 Campaign co-chairs and UNB alumni David Ganong (BBA ’65, LLD ’12), executive vice-chair, Ganong Bros. Limited, and Robert Quartermain (BSc ’77, DSc ’09), chairman & CEO, Pretivm Resources Inc., emceed the event, setting a fundraising goal of $110 million for the campaign, the largest in UNB’s history. Half the goal – $55 million will be dedicated to financial support for undergraduate and graduate students. The other half will be used to enhance UNB’s faculties and academic programs. New support for internships, co-op placements and study abroad experiences will create additional opportunities for students to engage in experiential learning. “We want to give our students a great start by improving access to quality education, supporting excellence and creating new opportunities to apply what they learn,” said Dr. Ganong. “We want to invest in our faculties because a great university requires great researchers and instructors. Dr. Quartermain announced at the launch that he is making a personal donation of $500,000, which will be used to fund the Quartermain Earth Sciences Scholarships and support the development of UNB’s Centre for Healthy Living. This campaign builds upon the university’s history and intensifies its impact on the world. More than $77 million has been committed to the It Begins Here campaign already by alumni, friends, corporations and foundations. UNB intends to raise the remaining $33 million over the next 18 months. To learn more about It Begins Here and to support this historic campaign for UNB, please visit unb.ca/itbeginshere.